Hand pie- it’s a perfectly cromulent word. These could have stayed in the oven for another five minutes for that golden brown deliciousness. Worlds collided today when the girl brought home My First Cookbook, which has a pastry recipe, and I picked a zillion apples from our tree. A surprising number of them weren’t wormy. Look how many of them don't have worm holes! We don't spray or anything, so worms are the rule rather than the exception. 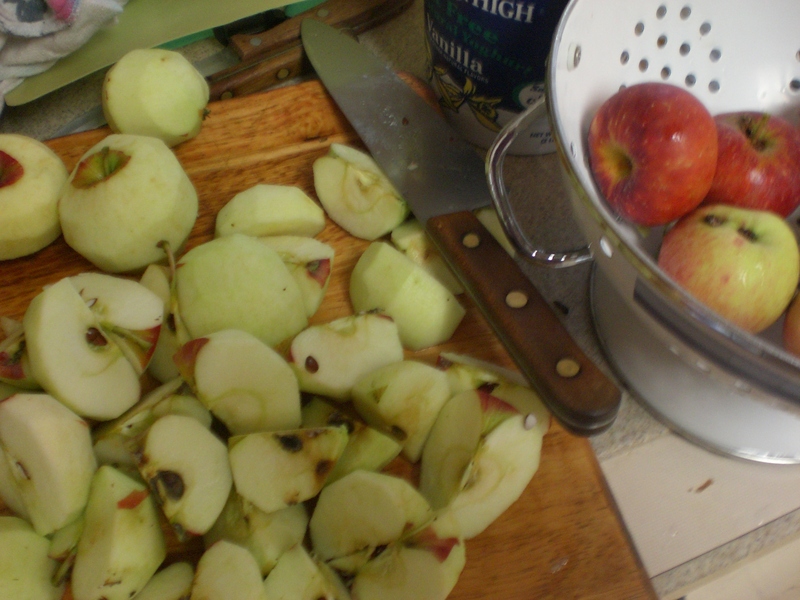 I chopped enough for a crockpot full of apple sauce, and a pie. Then the girl’s recipe turned out to be for tarts, and I said, what about hand pies? Hand pies, she asked, did you just make that up? Ummmm, no. I’m sure I’ve heard it somewhere. So, we’ll cut circles, put in apples, then fold them over. The circle we chose to use was the ring from a half gallon sized canning jar, which made lilliputian sized pies…They’re very cute. The girl made pie crust for the first time, and we actually should have asked Grandma or Great-grandma for lessons, because I think I’ve only made pie crust twice before in my life. The girl did a good job, though, it’s nice and flaky. Baked them for a surprisingly long time- I guess I’ve learned something with this project, because I keep saying how surprised I am. It took about 25 minutes at 350, which was enough to brown the bottoms and lightly brown the tops. The apples are still a touch crisp, so it could have gone even longer. 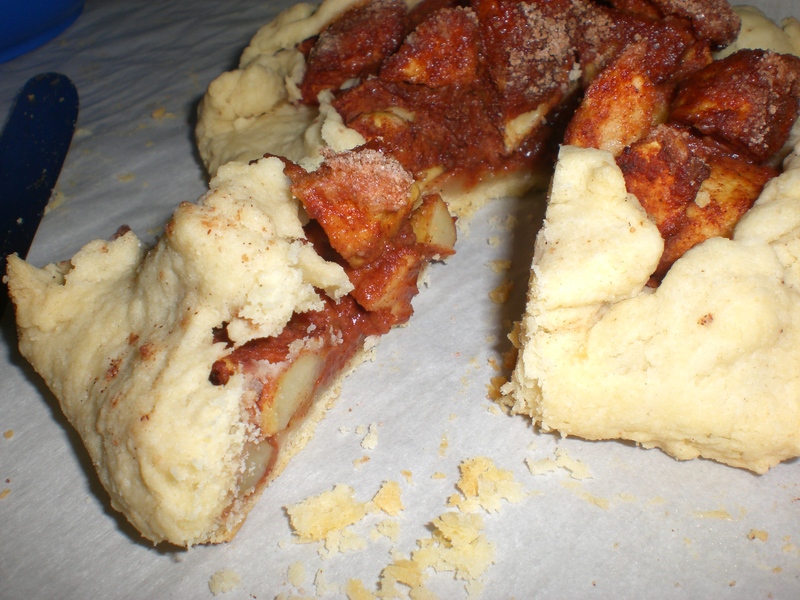 We had enough for 6 half moon shaped pies, and I rolled the scraps into a freeform circle, dumped the rest of the seasoned apples into the center, then folded the edges up over it, into a rustic apple tart. “Rustic?” she says, as if that isn’t a real word. Rustic is totally a word! The rusitc tart held together beautifully when cooled and sliced. Promise me you'll eat this with ice cream. your favorite pie crust recipe, or whatever instant pie dough solution you like best. Toss the apples, sugar cinnamon and flour together in a bowl. Roll out the crust and cut reasonable-sized circles. On reflection, the canning lids, about 3 inch diameter, made very small pies. 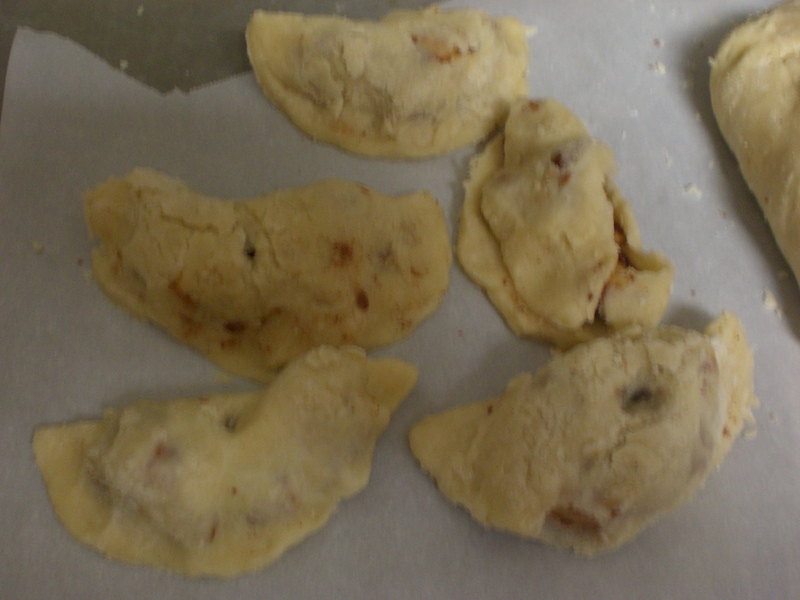 Place on a parchment paper covered cookie sheet, fill with the apple mixture, fold over and bake for 25 or more minutes. For once, we forgot to put sprinkles on top, but sprinkles would have been good. For the rustic tart, I was recalling something I read in Cook’s Illustrated a year ago, so there are probably better sources of instructions. Roll out the dough, place apple mix in the middle, with a good 2 inches of border. Fold up the edges and crimp it, then bake for 35 to 40 minutes. Because the top is open, it is easier to test these for doneness- just stab an apple with a paring knife to see if they are soft enough.